Nagaland is a land of festivals with every tribe having their own celebrations at different times in the year. These festivals celebrate our heritage and remain significant even in today’s context. 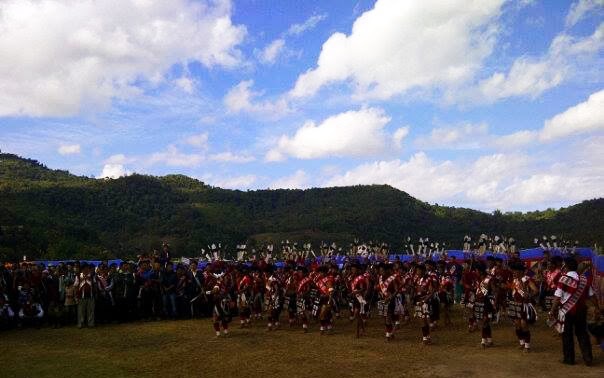 Just before the start of Nagaland’s Hornbill festival, the Rengma Nagas celebrated NGADA on 28th November. Ngada is not just a festival. It is the greatest Rengma festival of all other festivals. It is a post harvesting festival celebrated at the end of November or beginning of December depending on the position of the moon. It begins with a declaration made by the village high priest (Phensegü) who announces the beginning of the festival. Every citizen awaits eagerly for this declaration. By then, the last grain collected from the fields must reach home. It is taboo to bring home any more grain after the pronouncement. It is also known as a thanksgiving festival. It marks the end of the agricultural year and the dawning of a new year. Ngada derives its meaning from Rengma. ‘Nga’ means festival and ‘da’ means big. It literally means the biggest festival of all. Ngada represents the totality of life that embraced the yearlong hard labour blessed with overflow of wealth. The first day starts with preparation of rice bear. Everyone in the family will stay home and prepare rice beer together. The second day is assigned for collection of banana leaves in the jungles. The third day is for cleaning of graves by the womenfolk and placing of the rice beer wrapped in the banana leaf on the graves of the dead. This is a symbolic practice of sharing the rice beer with them. The day is set aside for drinking of the rice beer by the eldest member of the family, followed by other members. The whole village is cleansed on this day. The fourth day is reserved for dancing, eating, drinking rice beer, and visiting khels, Morungs dressed in full traditional attire. Women do not participate in the Morung feast. The fifth day is for dancing, singing, eating, and sports like kicking, jumping, and making camp fire by male folk. The male members visit the houses on this day and each house offers something to show their appreciation. The sixth day is a day meant for freely visiting house to house, khel to khel and clan to clan. Community feast is served with special rice beer. The seventh day is allotted for collection of firewood, banana leaves, and vegetables for the grand feast on the next day. The eighth day is the final day of the grand feast. The whole village population participates in the grand feast. The grand feast signals the departure of the souls/spirits of the dead, who have died the previous year, to go to the land of death. The conclusion of the festival marks three important things: a) agreement with fire to prevent future fire accidents b) agreement with rats to prevent destruction of crops or household goods c) rite to expel evil spirits. Ngada has been handed down from time immemorial by our forefathers who were first worshippers of nature and spirits. However, with the advent of Christianity, many traditional practices have undergone transformation. Although our traditional practices are not celebrated in their original form any longer, we, Rengma Nagas continue to honour the tradition of our forefathers by celebrating Ngada in November every year. Today, Ngada is celebrated for one day but with the same respect and honour we owe our forefathers. We celebrate our heritage today with great pride and joy because we owe our future to what the past has given us. Even as time moves on, we continue to move forward, always remembering where we first came from and never forgetting our roots. Ngada celebration is testimony to the belief in our past, a practice that continues to reflect in our lives even in today’s context. i. Religious: Ngada was celebrated by our ancestors as per their traditional religion of worshipping nature and spirits. This celebration was a form of reverence in order to appease the spirits. The appeasement of spirits was practiced in order that the evil spirits do not harm the people. In line with that, today, we receive and invoke God’s blessings as Christians. This is a day for us to worship the Lord with thanksgiving in our hearts and acknowledge the blessings he has provided throughout the year. In this way, we Christians celebrate Ngada, with a renewed sense of hope and joy in our hearts that God will continue to provide us with the blessings that we deserve. ii. Social: One accord, peace, unity and reconciliation were dominant qualities visible in the Ngada celebration. On this day, socially disadvantaged people are helped and taken care of. Our Naga way of being hospitable, I believe, emerges from our close-knit tribal community and values in the past. These qualities continue to exist till date. iii. Political: Recognition of leadership qualities in terms of village authority and administration was respected and acknowledged by all the members of the tribe. There was no room for exploitation. Our earlier healthy practices need to be retained or remodeled where necessary, so that there is no room for bribery, corruption, nepotism or unfair means. iv. Economic: Ngada was the time to reap the benefits of the hard labour practiced during the entire year in the fields. Therefore, in one way Ngada is also a celebration of economic prosperity. Everyone proudly rejoices for the year-end collection of grains and other crops. Even in today’s modern life, Ngada remains a day of thanksgiving for the harvest/work as we enter a new festive season. It is a day to remember the many blessings we have achieved through our hard work be it in the office, the home or the field. We celebrate Ngada today as a colorful event, with great mirth and pride as we don our traditional attire and eat our local cuisine. Likewise, with the onset of the festive season and the ongoing Hornbill Festival, let us honour our past tradition, while also moving forward with a vision for a brighter future, one that believes in our past integrity, right values, good conduct, responsibility and sincerity to the purpose of our lives.